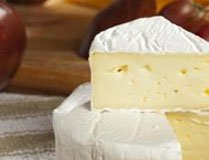 Brie originated from France, and is named after a place Brie. It is a soft cheese made from cow’s milk, and is 60 percent milk fat. It has a light, buttery scent and flavour with a salty finish.